If you’ve been a dog owner your whole life, you might be used to the needs of high energy dogs. On the other hand, if you’ve only ever had low energy dogs or you’re a new dog owner you be taken aback by just how much energy some dogs have. When you have a high energy dog it’s important to make sure that their energy has healthy outlets, otherwise you can run into some problems. When you don’t take proper care of a high energy dog by giving them the right amount of play and exercise, they can become destructive and form bad habits, like barking and chewing. It’s important to take your dog’s energy into account when deciding how much they need to eat too, since some working dogs and high energy dogs need more food than low energy dogs. A few dog breeds that are known for being high energy include Siberian Huskies, English Springer Spaniels, Border Collies, Australian Shepherds, Dachshunds, and Irish Setters. Typically, most dogs used as therapy dogs and working dogs are relatively high energy. It’s also important to keep in mind that even low energy breeds can have high energy individuals and vice versa. Basic obedience training is a good way to give your dog an outlet for their energy while teaching them to listen to your commands. When training your dog, it can be good to throw an extra part into the exercise that also trains them to be a little calmer. This can come in handy in a lot of situations, like when you need to keep your dog safe or want them to learn to stop jumping on people, for example. Instead of giving your dog a treat just for sitting, wait for them to relax before offering them the reward. This will help train your dog to do tricks and commands, while also teaching them that they can get attention and use their energy in a calm way. When training, focus on your dog’s natural strengths and only train for short periods so they don’t get overstimulated. Ideally after some practice, if your dog gets too excited or you need their attention you’ll be able to call them, tell them to sit, and automatically see them start to visibly calm down. Make sure to give your dog lots of praise when they start to get it right. After they get the hang of it you can try training them with extra distractions, like at a dog park with other dogs around. High energy dogs need more than a few leisurely walks per day to expend all their energy. If you’re not a very active person yourself, it’s possible that your lifestyle won’t exactly be suited to a high energy dog. Luckily, there are things you can do to allow your dog to use up their energy and have a lot of fun with them in the process. High energy canine sports are one solution. Start by taking your dog’s natural skills and talents into consideration when deciding what canine sport is best for them. A few great ones are agility courses, flyball relay races, frisbee, canine freestyle, tracking, and herding trials. Herding training facilities like Ewe-topia in Roy, Washington welcomes all breeds and can help take you and your best friend to the next level. These activities can burn off a lot of your dog’s energy in a healthy and constructive way, keeping your dog physically and mentally engaged. If you’re always on the go and live an active lifestyle, you might be the perfect fit for a high energy dog. A lot of high energy breeds are very intelligent. They love being around people, whether they’re working or going on adventures alongside them. Exercising with your dog can be a great way to bond and make sure that both of you are healthy and happy. 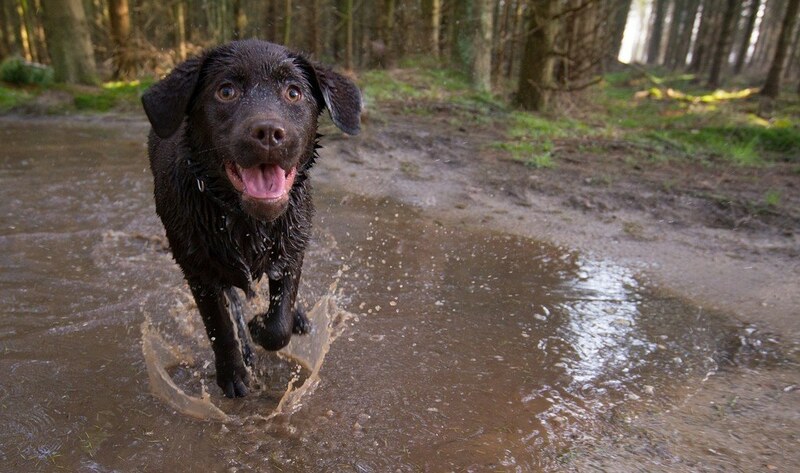 Running, swimming, hiking, walking, and biking, are just a few activities that can be good for your dog if regular exercise isn’t enough. However, it’s important to consider your dog’s breed characteristics and temperament when choosing an appropriate activity. For example, brachycephalic breeds overheat easily so owners need to be careful during outdoor activities. Isn’t it true that when our diet is poor, we lack energy and motivation? When we eat a lot of sugar and processed foods we tend to feel unhealthy, unhappy, and lethargic. Dogs aren’t so different from us. They require a high-quality diet to maintain their health and vitality. Believe it or not, a healthy-balanced dog food diet equals calmer, happier dogs. When you’re deciding on what to feed your dog, look for brands that are AAFCO certified, because it ensures that it will meet your dog’s minimum nutrient requirements. Avoid foods with artificial ingredients and preservatives, and check that named meat sources make up at least two of the top five ingredients. Make sure that you measure your dog’s food per their weight and adjust based on activity levels. Leaving some tough dog-toys around for your high energy dog gives them an outlet for their energy when you’re not around. This strategy reduces the chance that your dog will get bored or anxious and take up bad habits like barking too much or chewing on your stuff. Since high energy dogs can get bored easily, try to rotate their favorite toys so they don’t get tired of them too fast. Other ways you can keep your dog stimulated while you’re away is leaving on the TV or music or using treat toys like a Kong with peanut butter frozen inside. Leaving your dog at home alone or unattended for long periods of time without anything to do means that they will likely become destructive towards your things. Dogs even become depressed if they’re being under stimulated. Giving your pooch a doggy backpack is another great way to burn off that extra energy but also gives them a job and sense of purpose. You can pack in a first aid kit for you and your dog, a lightweight dog sleeping bag, bandages and tape and a tick remover. Bring them out on your walks together and just even walk around the yard. Have a read of our Backpacking with Your Dog article and begin your next hiking adventure together. Taking care of a dog is a big responsibility. High energy dogs can be even more than some owners bargained for, but with proper care and attention you can channel your dog’s energy in productive ways. A healthy diet, some training, and lots of exercise (look at a quality-dog treadmill if you're working and are busy) can go a long way in making sure that your high energy dog is happy and healthy, plus calm and obedient when you need them to be.